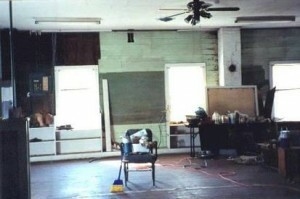 The Eddie Mae Herron Center in 2001 prior to restoration. For almost half a century, the building now known as the Eddie Mae Herron Center served as the hub for religious and educational activities for the African American community in Pocahontas and the surrounding communities. This small, unadorned, one-room frame building was built in 1919 and became known as the St. Mary’s AME Church. 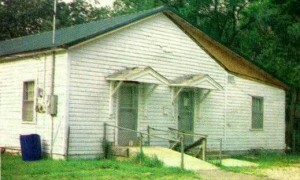 The building soon took on another name in keeping with its function: “Pocahontas Colored School.” For about thirty years afterits construction, the building would continue to serve as a church, while its function as a school would stretch on until the passage of Civil Rights legislation in the 1960s. In addition to these uses, the building has through the years housed many community events for the African American community. The history of St. Mary’s AME Church, also known as St. Mary’s Chapel, actually dates to “a short time prior to the year of 1865,” according to Arkansas Historical Record Survey/Church Inventory completed in 1941 by a WPA employee. The survey continues to lay out the church’s background: …a small group of people, consisting of four or five persons, decided they would like to have an organized church and church house for the colored people here in Pocahontas and in order to pay for their building they organized a Society for the purpose of raising the money, calling it the Union Aid. They gave suppers and what they called jug breakings. Each person put into the jug as much money as he or she felt they could afford. At a certain date given an entertainment was given the jug being broken and the contents counted. And in this way they paid for their building. In the year of 1865 they organized the African Methodist Episcopal Church. This church house was in the Northern part of the city (Bland at Schoonover Street). In 1919 this building was torn down and moved to the South part of the city (Archer at Pratt Streets) where the colored race are more thickly settled, and they are still having services there. The popular name for the church has always been St. Mary’s Chapel. Active organizations of the church included Sunday School and Missionary Society. The record goes on to say the earliest clergyman was Wess Powers (1865), but the first settled clergyman was J. M. Turner (1865-1868); another minister was Rev. W. N, Knox (1940-41). According to the late Omah Taylor, daughter of slaves, The colored church was also the school and was located at the same spot where they later built the city water tank, on Schoonover Street. A group of individuals—the St. Mary’s A.M.E. Board of Trustees—purchased two lots in the Shannon Addition of Pocahontas in August of 1918. These trustees were Bob Taylor, Ransom Looney, W.H. Powers, and Henry Armstrong. Once the building was constructed, Deacon Henry Taylor pastored the church until his death in 1948. During these years, as early as the 1930s, the African American community in Pocahontas also began using the building as a school, though the school year in those early years lasted only a couple of months, and the education program lacked a clearly defined structure. Although the building remained technically a church, the religious function of the building waned. Church services were held less regularly after the death of Henry Taylor, and the school function became predominant. The Pocahontas Colored School, as it came to be called, continued to function even after Brown vs. Board of Education declared segregated schools inherently unequal and unconstitutional. Children in grades one through eight continued to attend school this single room as before, only now they received a measure of financial support, limited services, and over-sight from the public school system. Pocahontas Public Schools began furnishing a bus to transport Black children ingrades nine through twelve to a segregated Black school in Newport. The one and only teacher in the Pocahontas Colored School from the time it came under the jurisdiction of the public school was Mrs. Eddie Mae Herron. Mrs. Herron came to the Pocahontas Colored School when her job as teacher at the Biggers school for Black children ended with the school’s closure. Those children were bused to the Pocahontas Colored School at that time. Mrs. Herron was still the teacher at Pocahontas Colored School until Civil Rights legislation forced integration of the school at the end of the 1964 school year. The church/school building ceased to exist in that function at that point. In 1967, Black River Area Development Corporation, a community action agency assisting low-income families, acquired use of the building as a pre-school/day care center under the name, McDonald Head Start/Day Care Center. This agency added a kitchen area, as well as a “side room” for additional space. 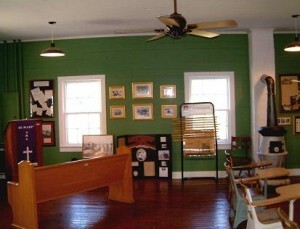 Other modifications included floor carpeting and paneling and other alterations to the walls of the original room. The building continued to serve this function until 1985, when a new day-care center was acquired and the facility was no longer needed. Local leaders of the African American community became concerned at the deteriorating state of the historic building. 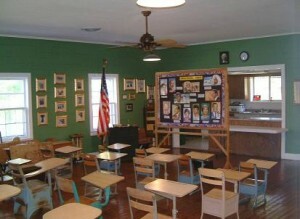 In 1986, Roland and Helen McCarroll contacted the building’s owners, the Pocahontas School District, and received permission from school officials for the building to be used as a Senior Center where quilting, crafts, and other community activities, such as feeding of bereaved families, could take place. Once permission was granted, the building once again became a community hub for the African American community in Pocahontas. Upkeep of the building proved expensive and difficult, however. Their continued concern and interest in preserving and restoring the old church/school prompted younger members of the African American community to begin preservation efforts. 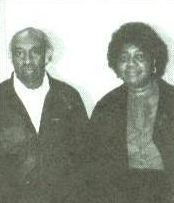 In November of 2000, Pat Johnson organized those who had attended school there, as well as members of the older generations, to create the “Eddie Mae Herron Center” Board of Directors. This group of twelve members of the African American community formed a nonprofit corporation and secured community support. The initial encouragement forthe task came from Wayne Gearhart, Director of the Pocahontas Area Chamber of Commerce, and was followed by support from the City of Pocahontas, Black River Technical College, and many other community groups and individuals. In April, 2001, the Eddie Mae Herron Center Board requested and received from the Pocahontas School District a quitclaim deed to the property. The Board set as its goals restoring the building to its original state, establishing it as a museum to tell the story of the African American experience in Randolph County, and securing funding to maintain the facility in the future. The project received a needed lifeline when the Pocahontas City Council provided $35,000 in funding assistance. In addition, many individuals made donations for restoration purposes. A new roof was installed, part of which is the same sort of metal covering as on the original roof. 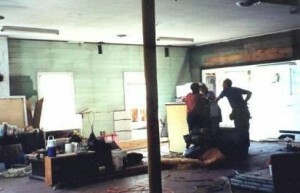 Other work included the installation of blown-in insulation and central heat and air; plumbing up-dates and other restroom alterations; the addition of period-appropriate school house lights and ceiling fans; and restoration of the original floor and walls by the stripping away of newer surfaces. Black River Technical College hosted a town meeting in the fall of 2001, bringing together the Eddie Mae Herron Board and other interested supporters with representatives of the Historic Preservation Alliance from Little Rock. Following this meeting, the Eddie Mae Herron Board affirmed its desire to secure selection of the building on the National Register of Historic Places, and made all subsequent modifications in accordance with this goal. BRTC pre-pared and submitted the nomination, which then was approved by the Department of Arkansas Heritage for inclusion for the National Register. Eddie Mae Herron Center after renovation. The BRTC Foundation applied for and received a grant from the Arkansas Humanities Council for a celebration of the official opening of the Eddie Mae Herron Center. The grant and matching support by the College covered not only the public lecture, tours, and performances marking the opening of the center, but also the purchase of educational materials—videos and books—to be housed in the center for use by students of all ages. The Eddie Mae Herron Center building is one of the few extant physical reminders of a time in the history of Pocahontas, Randolph County, and the state of Arkansas, when African Americans were denied basic opportunities, such as schooling, readily afforded their white fellow citizens. It serves as a remembrance also of the exclusion of African Americans here from social interaction with their white neighbors. Spanning roughly the half-century from the end of World War I to the Civil Rights era of the 1960s, the building gives testimony to the way of life for the Black population of Pocahontas and Randolph County. Though much attention has been given the history of race relations in those areas of the South where African Americans formed a significant number of the overall population, little note is given in history texts of the plight of those such as Randolph County’s Black populace, which peaked at about 6% of the county’s total population in 1860, but had dropped to about 2% by 1930, approximately where it remains in 2002. Black schools existed during those years in other communities in Randolph County: at Biggers, Peru (near Cherokee Bay), and at Birdell (New Hope School # 79), for example. The New Hope school building has been converted into a private residence; most other segregated Black schools have disappeared, and have likely been destroyed. This building alone, then, offers the public opportunity to visit or re-visit the local experience in a relatively authentic setting. It is a setting which provided its people services and opportunities the larger local, state, and to great extent, national, communities would not. The building was a haven where the people could worship, where the children could be educated, and where the African American community could sing and mourn, dance and play, enjoying the fellowship and celebrating the important functions and milestones of their lives. Interestingly, the building is notable also for the functions it apparently did not serve. No known record and no forthcoming recollections exist to document meetings when the African American community in Pocahontas tried to organize themselves politically or to take action of any kind in response to their station in life. The prevailing approach to the way things were for this tiny minority in a community where their rights were so regularly ignored was simply to keep a pall of calm, to keep out of any spotlight, to cause no trouble, make no waves. Clearly the St. Mary’s Church/Pocahontas Colored School posed no threat to the white citizens; its silence on certain matters is thus noteworthy, and its story all the more compelling. The building is important as an element also of social history because of its contribution to the nurturing and development of a group identity, cohesiveness, and support network within the Black community. One visible remnant of this function remains in the building in the form of faintly discernible numbers on the wooden floor. These hand-painted numbers delineate the “cake walk” circle, used for fund-raising when needed. Fund-raising will continue to be a necessary element. In fact, the first formal event to be held in the newly restored Eddie Mae Herron Center was a candidate speaking/pie auction on May 16, 2002. The highly successful event gathered local and regional office seekers in the Democratic primary, with their brief messages intertwined with the auctioning of pies baked and donated by members of the community. The event raised a total of approximately $1,200 for use in acquiring furnishings for the facility. The building has an incredible story to tell to all who are interested enough to listen. It is the literal and symbolic framework holding the story of an often-ignored part of education in Randolph County in the last century. This is a true tale whose characters are the African American children, ages 5 to 16, seated on wooden benches and at their desks, huddled in winter months as closely as possible to an old pot-bellied stove. It is a story about the entire school working at Christmas time to produce elaborate Christmas plays in between their lessons on the basics: reading, writing, arithmetic. In this story, white administrators from the public school (after 1948) listened politely as the graduates delivered their speeches, then made speeches of their own, telling the students to “use what you have to make good in this world,” and handed out the diplomas to young people who, if they chose to continue their studies, rode a bus every day to other segregated schools, in Jonesboro, or, beginning in 1957, to Newport. This building exists still, and will hopefully continue to exist, and with it, the memories of those days. Appropriately enough, the Eddie Mae Herron Center will take on new significance in this new, young century, through its continued link to education. 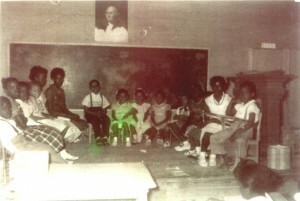 At this time, however, its “students” will include the African American community wholived through the experience, the older members of the white community, who either did not acknowledge or did not know at the time what was happening, and the younger generations of both groups, who perhaps have not yet heard the story.